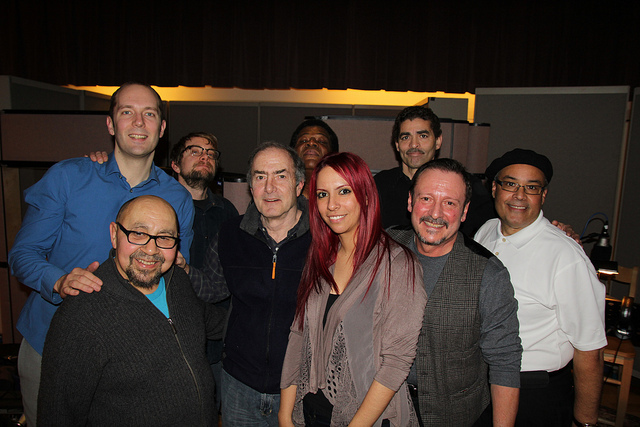 David Hernández and Street Sounds performed on The Afternoon Shift in February 2013. There’s a chance this blog might be a little sloppy. As I write, I’m a mess of tears. And these aren’t soft poetic tears but real sobs. My friend David Hernández had a heart attack at dawn today and died. David Hernández — that David Hernández — the poet, the city’s unofficial poet laureate, the playful dude in the fedora, the guy with the perennial smile. The famous poet. The street dude who took this little Cuban kid who’d grown up in Indiana and introduced her to the beauty of the city more than 30 years ago, infected her with his own enduring love for the muse that hurt and thrilled Nelson Algren and Gwendolyn Brooks and David himself and, eventually, all of us too. I was one of thousands: the writers and poets and musicians and painters who twirled around David, our magical imp, our towering barrio bard. Let me tell you what happened when David reached up and cupped your face in his hands: You felt like heaven itself was shining a light on you, like you had to be good. Not just good at what you do, but you had to be a good person because this good , good man loved you in that moment. A lot of people are going to talk about David and his poetry — and it’s important that they do. And they’ll talk about his legacy with Street Sounds, his poetry band, and his contributions to the Latino Arts movement in this town. And all of that is important too. But I want to say something else: I want to talk about David’s heart, David’s generosity, because that was his real gift. It wasn’t just that he taught and touched thousands upon thousands of students, that he helped so many poets get started in his classes or by inviting us to read with him, or that he’d talk us up at crucial moments. I can’t count the times people have said to me, David told me about you, David said I should read your stuff, David said you never call him but he still loves you. And this is the thing: David really did love us. Each of us feels that we had a special bond (because we all did!). He refused to forget us even when we forgot him. Refused to engage in our fights and jealousies. Refused to indulge our fears and prejudices. Encouraged us, without ever saying it this way, to be more like him. Accepting. Forgiving. But the thing is, he was always glad to be here, no matter how hard it was. Glad for the chance, happy to sit and talk and touch fingers, faces, fingers to your elbow, your shoulder. Was David ever happier than when he was hugging and being hugged by a friend (or a stranger)? Actually, yes: When he talked about Matea, his daughter. When he was with Matea, and he couldn’t wait to get off the phone to hang out with her but he tried to pretend hanging up with you was the worst thing in the world — he was an awful actor, an amazing dad, a great partner, a fantastic friend to all of us. I say us and what I mean are the unruly hordes he shepherded to artistic adulthood. You know who you are. Tell us your David stories, share his life and light with us, please. Goodbye, sweet Chitown Brown, buen viaje, mi querido amigo. Here&apos;s a complete bio of David to learn more about his accomplishments. Go here if you want to read the last piece I wrote about David for the Reader.